Pastor Ekechukwu was from a city called Onitsha (Nigeria), where he was the pastor of Power Chapel Evangelical Church. 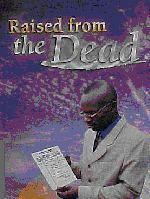 Nigerian pastor Daniel Ekechukwu physically died in the late evening of Friday, November 30th, 2001, was dead for at least 42 hours, visited heaven and hell during the time of his physical death, and was raised from the dead between 3:50 P.M. and 5:15 P.M. on Sunday, December 2nd, 2001 in the basement of the Grace of God Mission, located in Onitsha, Nigeria. Although some of what happened to pastor Ekechukwu is certainly extra-biblical, none of it is unbiblical. Indeed, neither the story of pastor Ekechukwu’s resurrection nor the story of your salvation is found in the Bible, making them both extra-biblical, but neither should be discounted on that basis! On Thursday, December 29th, 2001, Pastor Daniel Ekechukwu and his wife, Nneka, had a misunderstanding that degenerated into an argument that resulted in her slapping him. He was greatly offended by this incident, to the point of not acknowledging her greeting the next morning, which was, according to what pastor Daniel said to me, an attempt on her part to begin to reconcile. Pastor Daniel admitted that throughout the day of November 30th, he angrily thought about how he would put his wife in her place when he returned home. He would not, however, make it home that Friday. As he was driving home that evening, the brakes on his 20-year old Mercedes 230E failed as he was heading down a steep hill, and his car crashed into a concrete pillar that was built to prevent cars from going over a steep embankment. He was not wearing a seat belt (few Nigerians do), and his chest hit very forcibly against the steering wheel and its knob, apparently doing damage to his internal organs, as he was soon vomiting up blood and having difficulty breathing (not to mention that he soon lost all signs of life). Daniel was not able to remove himself from his car, but frantic on-lookers pulled him out. One bystander volunteered her car while another bystander offered to drive him to St. Charles Borromeo Hospital, not far away on the outskirts of Onitsha. Within minutes of their arrival at the hospital, a doctor began administering emergency treatment, but Daniel knew his body was not responding to it. He began praying the prayer of a man who knows he is going to die, asking God to forgive him of all his sins so that he would be ready to stand before the Lord. He also sent for his wife, Nneka, with whom he had refused to speak when he left his home earlier that day. She fainted upon hearing the news of her husband’s accident and condition, but when revived was taken by a Christian neighbor to the hospital. Daniel’s friend, Ede Samuel (whom I interviewed at length) was with her and essentially witnessed everything that transpired over the next three days. Upon seeing Daniel in critical condition when she arrived at St. Charles Borromeo hospital, Daniel’s wife burst into tears, begging her husband not to die and leave her. The doctor admitted that there was nothing he could do to save Daniel’s life (keep in mind this was a Third World hospital), and so Daniel requested that he be transferred by ambulance to Umezuruike Hospital at Owerri, where his family doctor practiced. The Umezuruike hospital was 80 km away. His wife arranged for the ambulance, and it was on the way to Umezuruike Hospital that Daniel died. Daniel was lying in the back of the ambulance while his wife was in the front passenger seat. He began to feel that he was not going to survive, and so he called for his wife to come to him. He began to say goodbye, give her instructions about certain church and personal documents, and admonished her to take care of their son and his church. She began sobbing greatly and amidst her tears strongly rebuked him for such negative statements. He was a man of God and should have faith, and not be speaking of dying! As she was speaking, Daniel saw two large angels who were completely white, including the pupils of their eyes. The angels were so large that Daniel later wondered how they fit inside the ambulance. One was as big as the ambulance. Daniel tried to speak to the angels, but one held his finger to his lips, motioning for his silence. The angels lifted him on either side, and Daniel realized that there were now two of himself. The angels were holding him under each arm of his spirit man (which was perfectly whole), while his broken body was lying below. Once they left the ambulance, Daniel became oblivious to the natural world. When the ambulance arrived at Umezurike Hospital with Daniel’s body, it was now late at night (Friday, November 30th), and Daniel’s family doctor was not there. A member of the medical staff, however, examined his body and sadly told Nneka that her husband was dead and there was nothing that could be done. So they drove to the Federal Medical Center in Owerri, but found no doctor there either. Finally they drove to the Eunice Clinic, and there Daniel was confirmed to be dead by Doctor Josse Annebunwa. There was no breathing, no heartbeat or pulse, and Daniel’s pupils were fixed. The doctor said that there was nothing he could do. A death certificate was issued at 11:30 P.M., November 30, 2001. They then drove Daniel’s corpse to his father’s house in a nearby village, and naturally Daniel’s father and other family members were heartbroken at the sight of Daniel’s dead body, weeping profusely. Daniel’s father instructed them to take his body to Ikeduru General Hospital Mortuary, not far away. They arrived there around 1:00 A.M. on Saturday morning. The resident mortician, Mr. Barlington Manu, received the corpse. The primitive Nigerian mortuary where Daniel’s body was taken had no cold storage facilities, and so the mortician injected embalming chemicals between Daniel ’s fingers and into his feet. The full embalming would be administered in the morning. With the help of a staff member he laid Daniel’s body on a mortuary slab between two other corpses. Ikeduru General Hospital Mortuary, is now known as Inyishi Community Hospital Mortuary. Mr. Darlington Manu, above, is the mortician who had partially embalmed Daniel in the very early morning hours of Saturday, December 1, 2001. 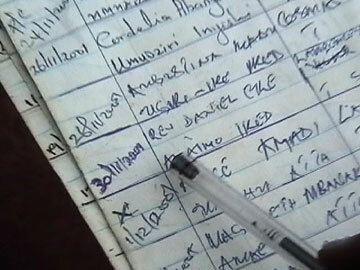 Above is the Ledger where Mr. Manu enters important information concerning every corpse that is brought to his mortuary. It contained hundreds of entries. Daniel Ekechukwu’s name is listed there, and the date his corpse was received was recorded as November 30, 2001. The date recorded that the corpse was taken by the relatives was December 2, 2001. The next morning, when the mortician attempted to cut Daniel’s inner thigh in order to insert a tube by which he could inject more embalming fluid, he experienced a strange shock that pushed him away from the corpse. This did not surprise him, as he had experienced similar forces before and attributed them to occult powers (such things are widely practiced in Africa and highly respected by most African pastors whom I know). After a second attempt and a second shock, he concluded that Daniel must have been a member of a powerful secret society. He assumed, however, that after some occult sacrifices and incantations the powers in the corpse would subside, and he could then complete his work. (This mortician, of course, was not a Christian, but converted after Daniel’s resurrection.) Incidentally, Daniel said that people could smell the embalming chemicals coming out of his body for two weeks after his resurrection. They would hug him and hold their noses! Around 2:00 A.M. Saturday morning, the mortician, who lived next to the mortuary, was disturbed by songs of worship coming from inside his mortuary, which stopped as soon as approached the mortuary doorway. Upon searching for the music’s source in his mortuary, he noticed light emanating from the face of Daniel’s corpse. This completely unnerved him. All of this so disturbed the mortician that he located Daniel’s father to inform him of what had been happening and to request that he remove Daniel’s corpse from his mortuary. Just before the mortician’s arrival, Daniel’s wife experienced a dream in which she saw the face of her husband, and he was asking her why they had left him in the mortuary. He stated that he was not dead and that she should take him to Onitsha where German evangelist Reinhard Bonnke was preaching. She determined to do so, even though her family thought she was out of her mind. It was now Saturday evening, and Daniel had been dead for 24 hours. The family finally yielded, but purchased a casket and brought funeral clothing for the mortician to dress Daniel. The mortician, however, had to cut the clothing in order to clothe Daniel because his body was as stiff as a board. An ambulance was hired on Sunday morning, December 2nd, and the casket that contained Daniel’s body was taken to Grace of God Mission (a large church) in Onitsha, about 1½ hours away, where evangelist Reinhard Bonnke was preaching at an afternoon church dedication service. They arrived at the church around 1:00 P.M. The church grounds were being protected by swarms of federal and state security guards for the sake of Reinhard Bonnke, who has received many death threats, and who is hated by Muslims all over Africa. (Not to mention the fact that the World Trade Center had been destroyed by Muslim hijackers just weeks before.) For this reason, the security guards would not allow the casket to be brought onto church grounds, thinking it might actually contain explosives. Daniel’s wife loudly pleaded with them, and opened the casket to show them her dead husband, which resulted in their mocking and even flogging her because of her persistence. She caused such a disturbance that the senior pastor was notified, and his son instructed that Daniel’s wife be permitted to bring his body to the church without the casket, and that it be placed in the basement. Daniel’s body was laid there on two tables pushed together in a Sunday School room. Some believers gathered around Daniel’s body and prayed while Reinhard Bonnke, who knew nothing of the dead body in the basement, preached and prayed. Eventually, it was noticed that Daniel’s corpse twitched, and then irregular breathing started. (By this time, Reinhard Bonnke had left the premises entirely.) The attendant believers began praying fervently, and because his body was stiff and cold, they began massaging his neck, arms and legs. When those in the sanctuary got word that a dead man below was coming back to life, the basement room was soon jammed with people. Suddenly Daniel sneezed and arose with a jump. It was somewhere between 3:50 and 5:15 PM on Sunday afternoon. Daniel had died Friday night around 10:00 PM. He slowly became fully coherent over the next few hours. Here are some hard facts that won’t go away. For two days Daniel did not breathe, his heart had stopped beating. It was in a hot climate, not suspended animation in an ice chamber. He had been injected with a harsh chemical to keep back mortification. As a corpse he was carted around for hours, pulled about, and lay in an airless narrow coffin for hours. He should have had severe brain damage, but he is alive now without any ill effects. This is no unsupported claim of bringing someone to life privately, as in a house. Here was a public event, an open demonstration of revival from death. If anyone has to be named, it is Nneka. Her incurable faith alone prevented Daniel’s burial simply to bring him where she was convinced God could bring him back to life. She regarded Reinhard Bonnke as a man of God and that in the atmosphere of faith where he ministered this miracle was possible. The faith of Nneka dictated the whole event and her faith was honored. By whom? Who honored her faith? If not God, who else? I would add to this defense that if the incident was a hoax, I doubt that pastor Ekechukwa would have invented the story of what happened to him when he was escorted to hell, which I will relate next. Pastor Daniel’s message is now one of repentance to the church, to prepare the church to stand before Jesus, and many have indeed repented after hearing his testimony. If his story is all a hoax, the result of this hoax is real holiness. Finally, the ministry of Reinhard Bonnke certainly needs no promotional hoax, as His Nigerian crusades are already attended by millions. He in fact states that he had nothing to do with the miracle, and wasn’t aware of the dead body in the basement of the church where he was preaching. As amazing as the story of his death and resurrection is, what pastor Daniel experienced after his death is even more amazing. To him, what he experienced between his death and resurrection could have taken only fifteen minutes, even though he was physically dead for almost two days. After he was lifted from his body by the two angels in the ambulance, he soon found himself momentarily alone, but soon joined by a different angel. Daniel stated that if he was confused about something that he saw or experienced, or if he had a question in his mind, this angel immediately gave him the answer. This angel first told him that they were going to Paradise. There was no time expended in getting anywhere the angel took him. As soon as the angel said they were going to Paradise, they were there. Daniel did notice one man who looked elderly among the multitude, and the thought occurred to him that perhaps that man was God, but the escorting angel immediately corrected him. The man was father Abraham. Daniel longed to join the worshippers, but the angel told him that there were other things Daniel needed to see. He told Daniel they would next go to see Jesus’ promise to His followers, the mansion He had prepared for those whom "He would find righteous on the last day." Immediately they were there. Daniel said there is no earthly way to describe what he saw. The mansion had no apparent end to its height or width. It continually moved, and each room also revolved in some manner. It was made of something that was transparent like glass, and the floors appear to be made of light. Daniel didn’t see anybody in the great mansion, but heard beautiful singing. Wondering where the music was coming from, the angel immediately pointed him to the many flowers around the mansion. When Daniel looked at them more closely, they were moving and swaying and singing praise to God! Next the angel took Daniel to hell, and they stood at the gate. When the angel lifted his hand and let it fall again, the gate opened, and Daniel could immediately hear the awful sounds of people screaming and weeping, but everything in hell was in total blackness. Then a bright light shone from the angel, and Daniel could see many groups of people in anguish. He told me of three specific groups that went through endless cycles of torment, forever reaping in hell what they had sown on earth. One group consisted of people who would eat their own flesh and then vomit it out onto the ground, at which time the vomit would fly back onto their bodies and turn back into flesh that they would eat again. The angel told Daniel these people were those who had eaten human flesh as an occult practice. Another group, who had stolen land from others while on earth, endlessly dug rock-hard ground with their bare hands. Another group, former fornicators and adulterers, endlessly mutilated their sexual organs, which after being destroyed, would be regenerated only to be mutilated again. As I heard Daniel relate this scene, I couldn’t help but thinking of how many times scr1pture declares that God will repay every person according to his or her deeds, and also promises that everyone will reap precisely what they have sown. I remembered the story Jesus told of Lazarus and the rich man. In the afterlife, their roles were exactly reversed. The rich man longed for a drip of water from Lazarus just as Lazarus had previously longed for a crumb from the rich man’s table. Pastor Daniel also saw the former military dictator of Nigeria. He saw a Christian who had dabbled in occult practices and fallen away from the Lord, and a pastor who had embezzled money from his own church and also lied about it. The former pastor pleaded that he would return the money if Daniel could help him escape hell. Although there were different kinds of tortures, all of the people in hell writhed in agony under an unseen force that would wrench them repeatedly. All of them were shouting, wailing and gnashing their teeth. Pastor Daniel told me that if every Christian could see what he saw, there would be no need to preach the gospel, as every Christian would become the gospel. The most surprising thing is what happened next. The escorting angel told pastor Daniel, "If your record is to be called here, you will in no doubt be thrown into hell." Pastor Daniel immediately defended himself saying, "I am a man of God! I serve Him with all my heart!" But a Bible immediately appeared in the angel’s hand, and it was opened to Matthew 5 where Jesus warned that if one calls his brother a fool he is guilty enough to go into the hell of fire (see Matt. 5:21-22). Pastor Daniel knew he was guilty for theangry words spoken to his wife. The angel also reminded him that Jesus promised that God will not forgive our sins if we do not forgive others (see Matt. 6:14-15) because we will reap what we have sown. Only those who are merciful will obtain mercy (Matt 5:7). The angel told Daniel that the prayers he prayed as he was dying in the hospital were of no effect, because he refused to forgive his wife even when she attempted to reconcile on the morning of his fatal accident. Finally, pastor Daniel was led to the top of a mountain, at which there was a large hole full of darkness. There the escorting angel handed Daniel to a man standing there whom he didn't recognize at first, but soon realized it was German evangelist Reinhard Bonnke. The angel told Daniel that man would help him spread the gospel of salvation. Both Daniel and Rev. Bonnke fell into the hole, and that is when pastor Daniel jumped up from the table where he lay at the Grace of God mission. He was back in his body after having been dead for at least 42 hours, almost two full days. As you may imagine, pastor Daniel greatly emphasizes in his preaching the need to forgive those who have wronged us, lest anyone suffer the fate he almost suffered. How important it is that we obey Jesus’ commandments regarding forgiveness and walking in love toward each other, as well as all the rest of His commandments. It is indeed time for the church to repent and "pursue peace with all men, and the holiness without which no one will see the Lord" (Heb. 12:14). Do not listen to false teachers who say that holiness is not essential to ultimately gain eternal life. Jesus warned that only those who do the will of His Father will enter the kingdom of heaven (see Matt. 7:11). Do not listen to teachers who say that if you are once saved you are guaranteed that you will always be saved. Jesus warned His closest disciples (see Matt. 24:1-3) of the possibility of their not being ready when He returned and being cast into hell (see Matt. 24:42-25:46). Keep in mind that pastor Ekechukwu did not stand condemned just because of his one sin of unforgiveness. There were other sins he was confessing in the hospital as he was dying, but his unforgiveness annulled his prayers in which he was asking for forgiveness. If we expect God to forgive us, we must forgive others. That is what Jesus said. Are you ready to stand before Jesus, sincere and blameless?